Harley® riders are some of the most discerning buyers anywhere in the world. They demand the highest quality in their bikes and in everything that plays a part of the Harley® life-style. At Colonial Harley-Davidson® we firmly believe that Harley® riders deserve only the best service as well. Our entire company culture is centered on providing the highest level of respect and care for our riders. 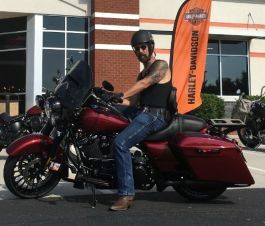 Every Colonial Harley-Davidson® team member is aware that our job is to serve your needs in the friendliest and most efficient manner; and then get you back on the open road doing what you love.